I find it hard to mount any case why the Eagles shouldn’t sign Plaxico Burress. Sure, he’ll be 35 by the time the season starts, and he’s certainly not a role model. But at this point I wouldn’t mind seeing Andy Reid sell a bit of his soul for better red zone production. 2011 was the first year since 2006 that the Eagles have even nudged above average in red zone touchdown percentage. And they haven’t been in the top ten since 2004. That’s a historic stretch of poor red zone play, and it spans three quarterbacks, two running backs, and two generations of wide receivers. It’s clear that outside of LeSean McCoy, whatever’s going on down by the goalline isn’t working. The speed-beats-all mentality that has made the offense so explosive in the first 80 yards of the field isn’t getting it done where it counts. It’s obvious even by the play calling. Reid and Marty Mornhinweg have long since abandoned the normal offense in the red zone. They’ve resorted to tricking their way into a touchdown with shovels and screens. The data proves this out. DeSean Jackson and Jeremy Maclin, despite game-breaking speed in the middle of the field, are both below average in scoring touchdowns per target and reception. Even at age 35, Burress is the opposite. He’s a touchdown machine. 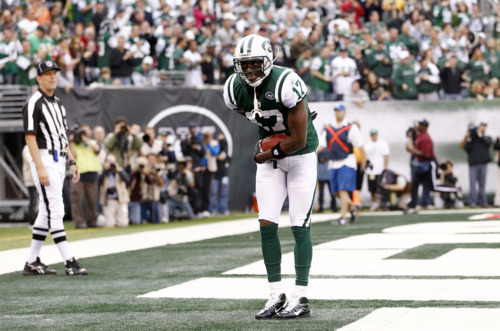 With the Jets last year, Burress scored a touchdown on nearly 18 percent of all his receptions. That’s more than Calvin Johnson, and good enough for third in the NFL among receivers with at least 50 percent of their team’s offensive snaps. Eagles fans will remember Burress constantly beating one-on-one coverage in the end zone for Eli Manning, and he could do the same for Michael Vick. Where all of the Eagles wide receivers become distractions at best and liabilities at worst down in the red zone, replacing one of them with Burress doesn’t just provide a different set of physical strengths (if so, Hank Baskett and Riley Cooper would have filled this role). Plaxico brings the experience of 63 career touchdowns — more than all of the Eagles current receivers combined. Burress wants to be an Eagle. He did last year too, but the front office picked Steve Smith instead. Time to correct that mistake. Tagged with Philadelphia Eagles, NFL, Plaxico Burress, Wide Receivers, Free Agency, DeSean Jackson, Jeremy Maclin, Red Zone, Touchdowns, Michael Vick. February 29, 2012 by Brian Solomon.